The next of our members is one of three generations of the Campbell family who regularly orienteer in the CHIG colours, Robin Cambell. 6th in M75 but 1970th if across all classes. When & how did you start orienteering? First event was a Come and Try It event in Epping Forest in 1971 organised by CHIG. The map was a 1:20,000 in black and white with a technical difficulty of 5 [I now believe] for the beginners course. Looking again at the map and the course suggests that line features were not readily available. I took ages getting round the 2+ kilometres. So I decided I had better improve my map reading and get a compass. The running was ok as I was coming from a running background. When did you join CHIG? Shortly after the Come and Try It event. But then, after orienteering in the 70’s, I departed in the 80’s to do other things like getting my PhD, running some more marathons and getting a number of books published before returning in the 1990’s when my son Robert decided to ‘O’. What do you like/enjoy about orienteering? Knowing that at the next event I’ll get it right. At least that is what I have thought for the last decade or so. The challenge is always there. What type of events do you usually enter? What course? Everything from colour coded to 6 day events and of course more recently the urban sprint events that I really enjoy. Typically I stay within my age class. What are your orienteering goals? I guess now to keep going as long as possible. And to get the Barbican right at some stage soon. Do you do any training for Orienteering? Yes and no. Ruby and I both go for a run before breakfast and would do so whether orienteering or not. Nevertheless the running does make it easier to get round courses at a reasonable speed. Robert tells me I should run with a map from time-to-time but I have not done so. I do try to visualise the terrain as a map on occasions as I run. 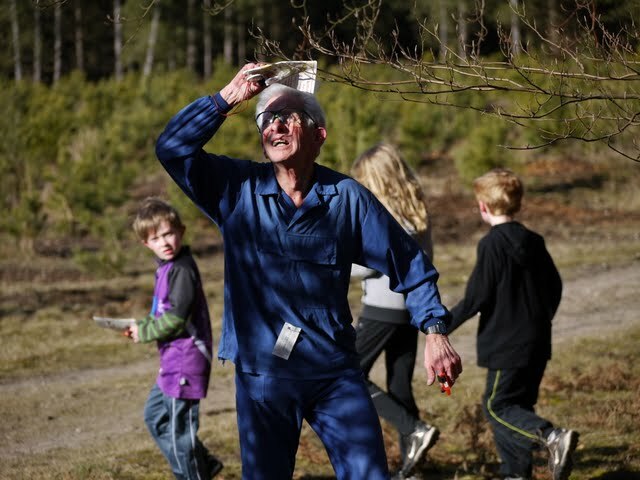 What is your proudest moment in orienteering? That was a few years ago when Robert M40, Ruby W60 and Alice W14 all got to represent England in an international competition. So over the space of a few months we had 3 generations as internationals. Previously in 1974 I had represented Great Britain in an international 6 day event in Bulgaria mainly consisting of countries east of the iron curtain. It included a night event – without head lamps – tricky. It was a fascinating competition. But unlike now, we had to give the tops back after competing! The WMOC event when it was in Portugal. The event was in the Kings Forest North of Lisbon with excellent fast open terrain but very intricate among the forested sand dunes. Brilliant. And the parking was always close to the event! No long complicated journeys to the starts. Running that a close second was the Aveyron event in France with fast running across limestone terrain where map reading and compass work was at a premium. Perhaps Ruby and I just enjoy orienteering in warm/hot conditions. I would like to see Organisers give full details of parking to start at the point of entering. Getting to know after entering of 2hrs from parking to start is a pain. Why not 9.00 registration and 9.30 starts during BST. 10.00 and 10.30 works well I think in the winter, but can seem late in the Summer..
Apart from orienteering, do you do any other sport or outdoor activity? Running every day plus cycling [but relatively short distances perhaps 8 – 12 miles on the bike] a few days each week. Ruby and I also enjoy walking in the countryside close by our house. In the past that would have been walking in the Lake District, Scotland and Switzerland. Recently I have been to Gunpowder Park [with others CHIGS], and elsewhere for a 9.00 Saturday 5km park run – increasingly popular, I think.